LEGO® Education today announced LEGO Education BuildToExpress, a new approach to learning that utilizes traditional LEGO bricks with a facilitative teaching process across many subject areas and enables students to develop a deeper understanding of what they are learning through reflection and dialogue. BuildToExpress provides a shared, nonverbal language that levels the playing field for classroom communication. LEGO Education BuildToExpress uses carefully selected LEGO elements within a unique, curriculum-based, ‘Build and Share’ context. It ensures that every student is given the opportunity to be active, engaged, and heard. Students are tasked with building models that illustrate their understanding of various curriculum concepts, for example, how they “view” democracy or how they visualize a historic event. It’s also an excellent way to boost classroom communication as students learn to actively listen, think creatively, and cooperate to solve problems. The professional development program offered by LEGO Education prepares teachers for structuring classroom lessons and for facilitating the dialogue so that they ask the right questions at the right time, which leads to students who are stimulated, inspired, and active in their learning. The process enables the teacher to be truly supported in the role of facilitator and provides an opportunity for unique expression by each student, which leads to differentiated instruction. 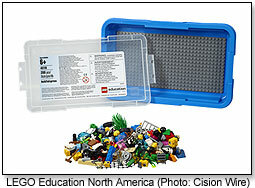 Since 1980, LEGO Education (LEGOEducation.com) has delivered hands-on, curriculum-based resources for teachers and students worldwide. 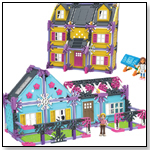 LEGO Education believes a hands-on, minds-on approach helps students actively take ownership of the learning process and develop 21st-century skills such as creative thinking and problem solving through real-life, engaging experiences. LEGO and the LEGO logo, logo are trademarks of the LEGO Group. ©2012 The LEGO Group.